When people hear of the Czech Republic, their thoughts often turn to Prague. In fact, many people associate this great city as being the Czech Republic but the country offers so much more than that. Having a few weeks driving all over, we experienced first hand just how true this is. Although we enjoyed traveling around the entire country, our time exploring Bohemian Switzerland National Park definitely blew us away! In the far north of the country, yet just 2 hours away from Prague, is a National Park so spectacular that you’ll feel like you have entered into a different world. A sprawling region dense with forest, sandstone peaks, and natural beauty that has been protected since 1972, you can only imagine how much of a hiking paradise this place is. 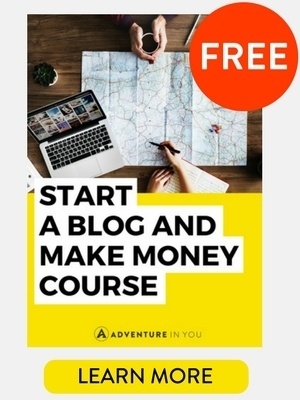 If you’re finding it difficult to imagine, don’t worry! 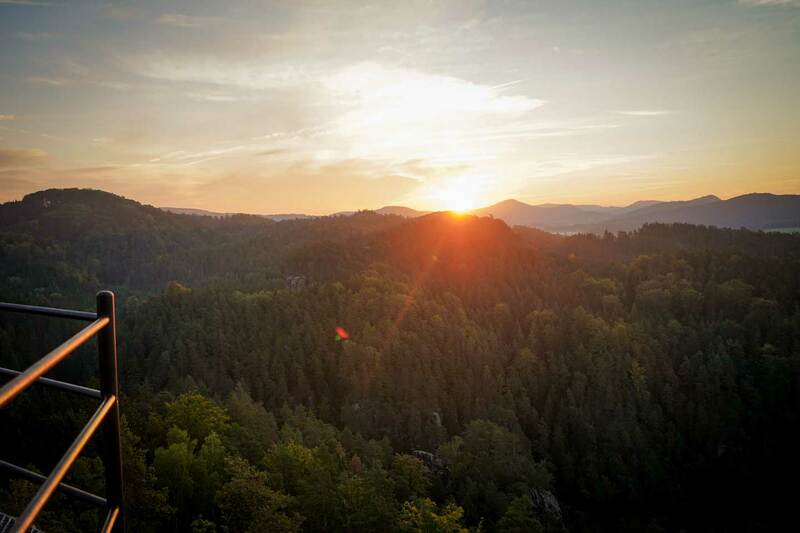 We’ve outlined our experience of exploring the best of Bohemian Switzerland National Park. Located in the North-Western part of the Czech Republic, the Bohemian Switzerland National Park lies on the Czech side of the Elbe Sandstone Mountains. 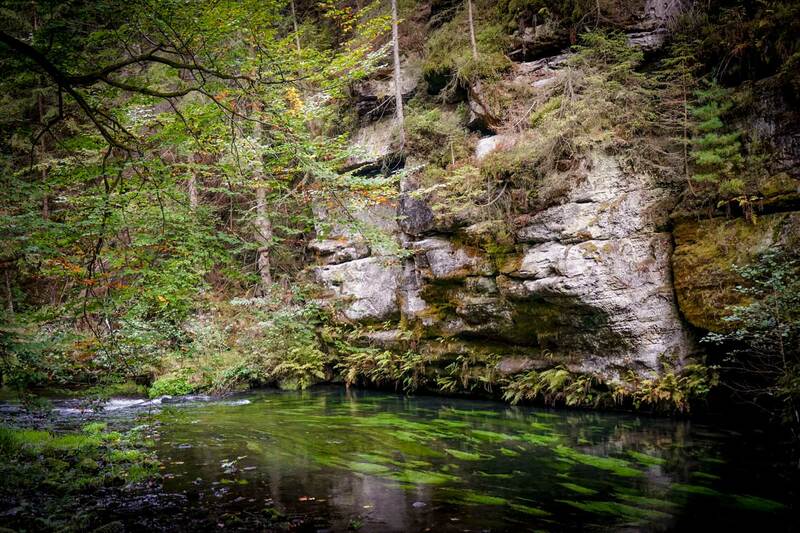 Known to the locals as České Švýcarsko, this beautiful nature reserve occupies a large area extends all the way to Germany. There, it is called Saxon Switzerland National Park. Filled to the brim with scenic viewpoints, beautiful sandstone formations, majestic ravines, valleys, and cliffs. If you are a big outdoor enthusiast, a trip to the Czech Republic wouldn’t be complete without seeing this beautiful place. As we wanted our road trip around the Czech Republic to be all about nature, we couldn’t wait to see this national park. To do this, we teamed up with Northern Hikes, a local tour company so we could experience the best Bohemian Switzerland Tours. The best thing about Northern Hikes for us is their commitment to promoting sustainable tourism. 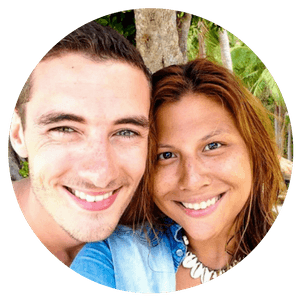 Working together with local business and entrepreneurs, they are constantly thinking up of new ways on how to show off this little slice of heaven that the company calls home. We spent a grand total of three days exploring every inch of this National Park (including a cheeky trip to Germany) and I have to say, every part of the trip was pretty phenomenal. Listed below are a few of the highlights and things to see within the national park. One of the main highlights of the national park is Pravčická brána (Pravčická Gate). This is the largest natural stone arch in all of Europe and is a monument that is truly a sight to behold. Towering 16 meters above us and stretching 26 meters across with a beautiful 19th-century chateau right beside it, I could have easily have spent more time here admiring this natural wonder. Everything from its towering size to the sheer beauty of this arch is impressive. There is a little food stall located right under the arch where you can buy some snacks and beer. P.S. drinking a cold beer while under the arch is an experience I would definitely recommend! Known as Tiské stěny in Czech, these popular rock formations are considered another highlight in the Bohemian Switzerland National park. Standing tall, these vertical rock formations made out of sandstone have become an icon in the national park. We made our way around these bizarre rock formations that were full of pathways of all sizes, leading to litte caves and holes that could have led to Narnia. In fact, this sandstone labyrinth was one of the filming locations for the Chronicles of Narnia so it’s no surprise that it made me feel this way! During the Winter season, this place turns into a magical labyrinth of snow-covered sandstone rocks. For the rest of the year, it is an outdoor playground for adventurers and mountain climbers alike. We were then guided to a lookout point which boasted views high above the Bohemian Villages. 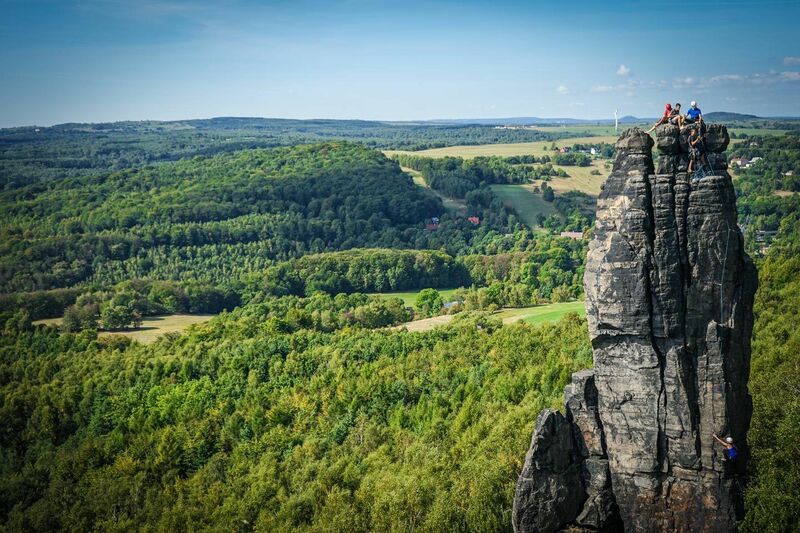 If one thing is to be said about Bohemian Switzerland and that is that you’ll discover some pretty sensational views during your time exploring the park! Edmund Gorge is a rocky canyon by the Kamenice River and is the last of the three gorges located east of the town Hřensko.In this beautiful canyon rife with lichen and green moss, you can see sunlight penetrating through the less dense areas of the shrubbery casting a mystical emerald glow over the water. The place itself is beautiful and the faint sound of water slowly moving downstream was nothing short of peaceful. At one point, you reach a part where you can ride a small boat which takes you down the Kamenice River. When we went, there were only a handful of us in the boat, making it super memorable experience. There we sat by the edge of the boat, eagerly taking everything in. The sunlight gleamed and danced along the water, little birds flying next to us, all while our boat glided through the river. Suddenly, our boatman broke the silence and happily played a tune in his harmonica. It was such a perfect moment and nothing short of magical. Mariina Skala or Mary’s Rock as some people like to call it is a 428 m rocky hill near the village of Jetřichovice. This rock is one of the best viewpoints in the National Park and is a photographer’s dream shooting location! As we were on a custom trip with Northern Hikes, we woke up bright and early to catch the sunrise from one of the most iconic parts on the National Park. Although it was freezing cold, we bundled up and began our ascent up a steep set of staircase up Mary’s Rock. After a few minutes of huffing and puffing, we got to the top and was taken aback by the incredible view before us. The sun had yet to rise and luckily, there was a small wooden hut where we could take shelter from the cold. Our guide Vojta, came prepared and distributed blankets to keep us warm. Soon, the sun began to illuminate the park, giving us the most incredible panoramic view of the entire place. The sky slowly started changing colors, giving us one of the best light shows imaginable. It truly was one of the best mornings during our entire trip. Although technically this part of the park is now located on the German side (Saxon Switzerland National Park), it is still worth mentioning. 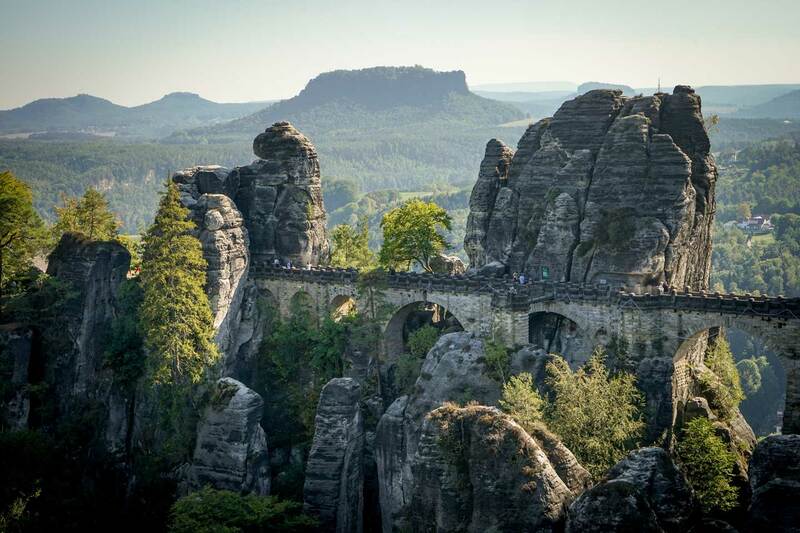 Having received its name from its popularity amongst Swiss artists and painters, the landscape of Bastei was said to be reminiscent of the Swiss Alps. Upon arriving in this place, you go for a short hike and immediately see the impressive bridge built just for tourism. It’s actually the first of its kind and allows you a unique view over these towering rocks. Although we chose to admire the bridge from afar, there is no doubt that it is a must-see while in the area. 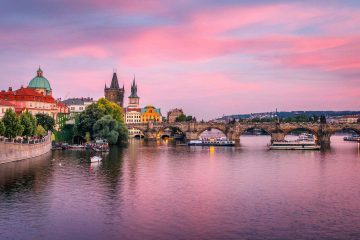 Editor’s Note: Take a look at our complete Czech Republic Travel Tips article featuring the best of what to see and do in this country. 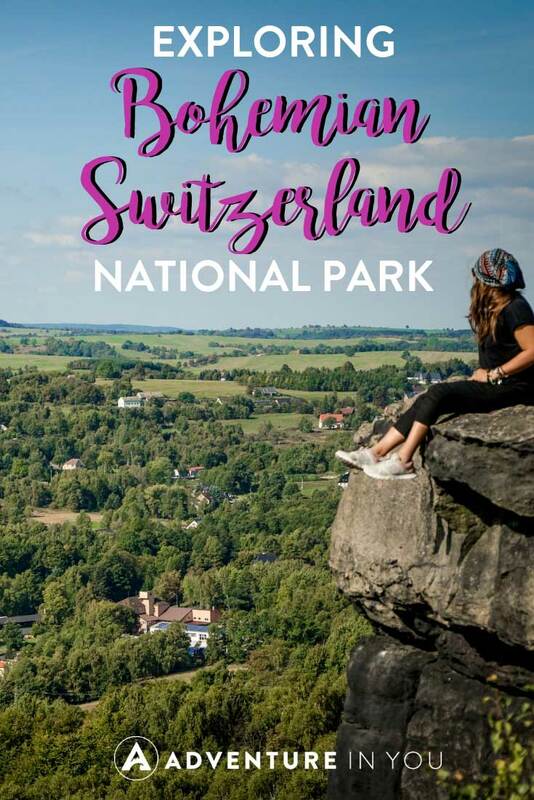 If you want to see any of the places in the National Park for yourself, we recommend going with the tours that Northern Hikes provide from Prague. These day trips are a convenient way to see the park explore the best parts. Listed below are a few of their most popular tours. 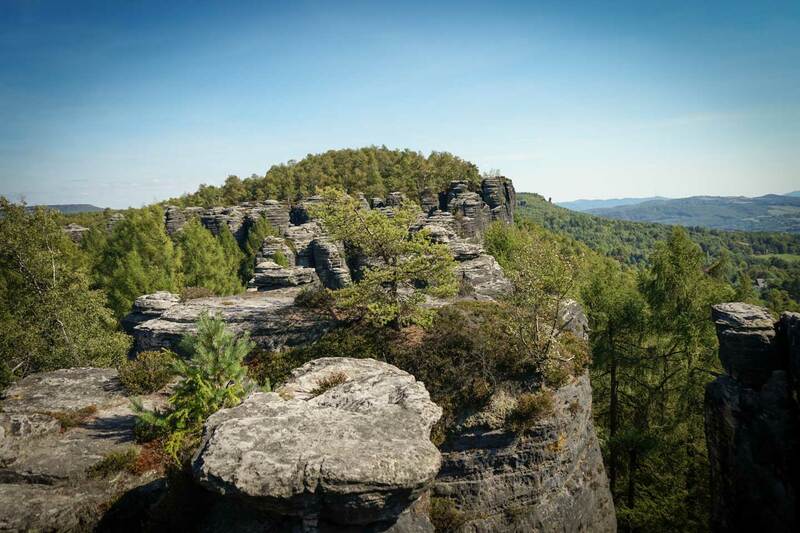 This is the most popular hiking package that Northern Hikes has as it takes you around the best parts of Bohemian Switzerland. 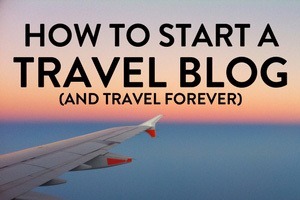 It is perfect for avid outdoor enthusiasts or those on a tight schedule. Offering pick up and drop off from Prague, you can spend the whole day getting active and exploring nature at its best. 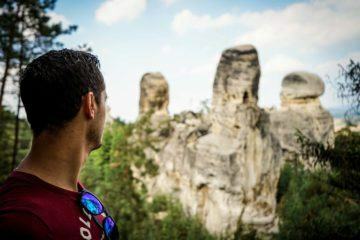 Hiking trails to breathtaking sites like the impressive Pravčická Gate and Gorges and Kamenice River, you can admire majestic sandstone formations and steep rock walls along the way. Complete with a traditional Czech lunch and a relaxing boat ride, it really is possible to do it all in just one day. If you’re looking for an easy and relaxing tour of the region that is suitable for families, the Boat Ride and Bastei Bridge tour will tick all of these boxes. 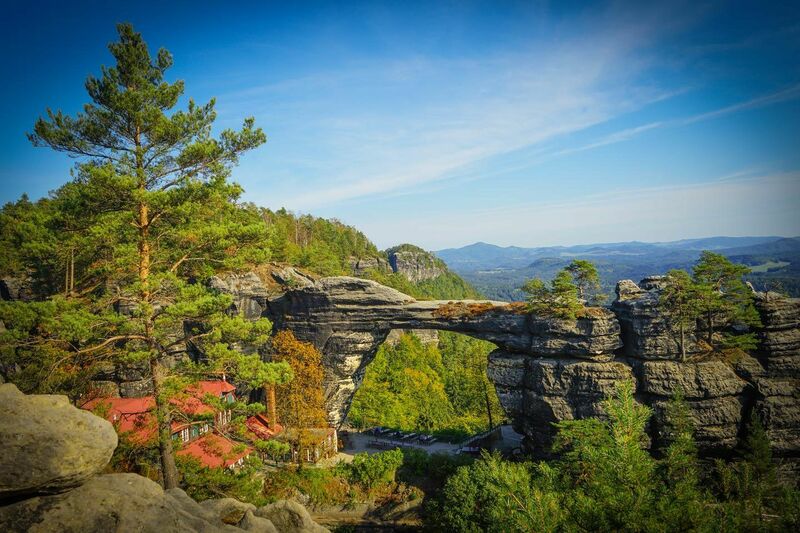 Spend the day exploring Bohemian Switzerland, enjoying views from several lookout points and visiting two major sites: the famous mountain bridge “Bastei” and Neurathen ruins. Fill your bellies with delicious Czech food and end the day with a scenic boat ride through the picturesque gorges of River Kamenice. If you’re a budding photographer or an expert looking for a unique photo opportunity, the coffee and canyons tour could be the experience that you’re looking for. We went on one of the inaugural coffee and canyons tour and loved the entire experience as it allowed us to see a few of the best off-the-beaten-path places within the National Park. We started off with a coffee ritual right in front of the Pinnacle of the Doggenturm. 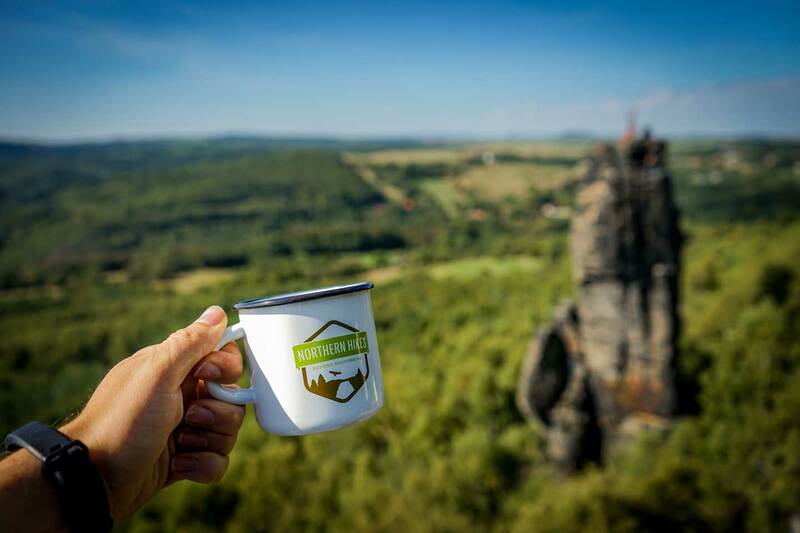 This scenic rock provided a fantastic backdrop as we drank our coffee which was freshly made with the Aeropress that our guide Vojta brought. For this particular tour, Northern Hikes collaborates with a local coffee shop, Bohemian Coffee House to provide us with fresh beans to complete the entire coffee experience. 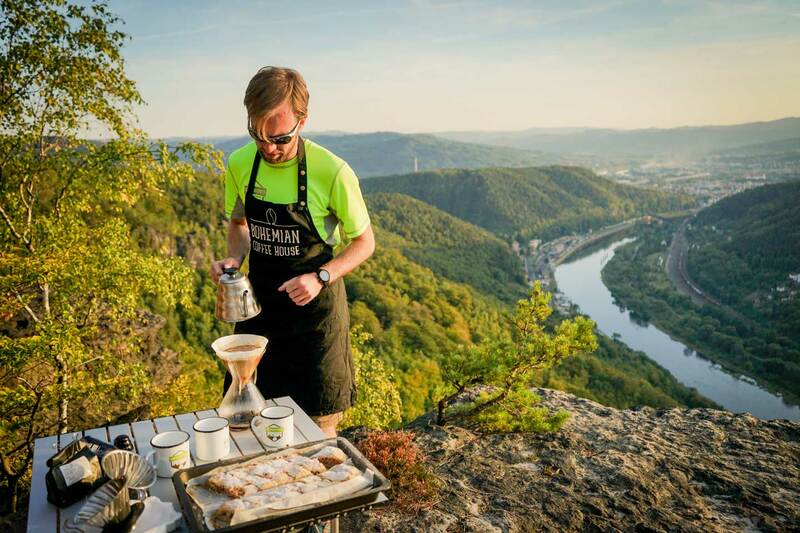 Our next spot was hiking to Rose’s Ridge where we got to capture spectacular photos of Europe’s Highest Sandstone Canyon all while enjoying yet again another batch of freshly made coffee. During the trip, not only did we get to explore unique methods of making coffee, we also got to see some of the lesser known parts of the park which is one of Northern Hikes’ way to fight over tourism. We sat by the edge of the canyon, drinking our freshly brewed coffee (and eating our homemade pastries), this tour is definitely something I recommend joining if you’re a lover of coffee and the great outdoors. While in Bohemian Switzerland, we stayed in two different places. We spent the first night in Falkenštejn Hotel and Brewery which is both a brewery and a hotel. If you stay here, you MUST sample a few of their local brews as it is delicious! We also spent one night in Na Stodolci, a rustic wooden cabin set in a farm. This place was beautiful and had such a peaceful vibe. Even if you don’t end up staying here, come for a meal as the food is absolutely delicious. Specializing in farm to table meals, nothing beats their traditional homecooked Czech dishes only to be washed down by their special fox beer brewed by Falkenštejn just for their restaurant. As much as we love Prague and many of the local villages that we came across on our road trip across the country, hiking around Bohemian Switzerland National Park was just a special experience that really made us fall in love with the Czech Republic. It is definitely one of our top places to visit in the Czech Republic. From our short time here, we highly recommend booking a tour with Northern Hikes. 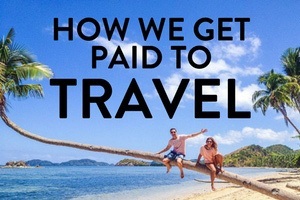 Not only did they make this whole experience effortless for us, but the guides also made it unforgettable. Filled with such passion and dedication for the work that they do, their love for this region is almost palpable when you listen to them talk about it and it is incredibly infectious. Our trip was filled with endless walking, fascinating knowledge, and countless beautiful views, but it is now even with tired muscles that I know that I would go back in a heartbeat. This National Park will only continue to grow in much-deserved popularity, so for those of you who seek adventure, natural wonders, and a physically rewarding experience, this gorgeous landscape of sandstone pinnacles in the north should be your first port of call. 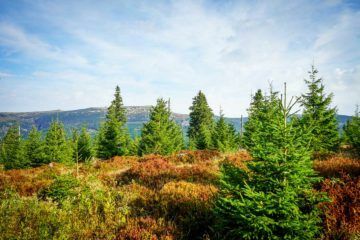 Note: Our hiking in Bohemian Switzerland was done in partnership with Northern Hikes and Visit Czech Republic but as always, all thoughts and opinions are always our own and remain unbiased.